Now you can start dreaming about space all thanks to this Rick And Morty Sleep Set. This women’s pajama set is made from 95% cotton and 5% spandex and comes in women’s sizes Small – 2XL. 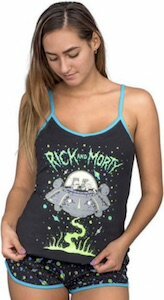 The sleepiest has fun shorts that has a print of planets and stars and then there is a cami tank top with on the front the text “Rick And Morty” and below it a space ship with inside it the main characters of this fun animated series. Lounging around the house or just a good night sleep this Rick And Morty pajama set is just what you need. Now Rick And Morty fans can have their own Mr. Meeseeks Cap. 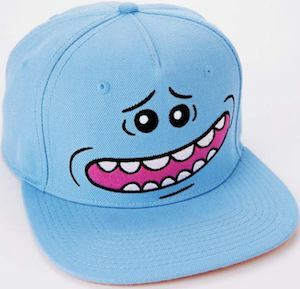 This light blue cap is the same color as Mr. Meeseeks and then on the front you can see his typical face that adds some pink to the design. This Rick And Morty cap is adjustable in size so that it will fit almost anyone and that means that all the true Rick And Morty fans can be wearing Mr. Meeseeks on their heads. Baseball caps are something anyone can wear and wearing this will look great and the fun color really stands out a bit as it is so cool. Now there is a cool Rick Painting Your Shirt. This Rick and Mory t-shirt comes in styles for both men and women and in sizes Small – 6XL and the shirt is made from 100% cotton. On the shirt you can see Rick and he is busy to paint you white t-shirt in to a purple t-shirt and he uses a roller to do so . If you really like Rick and Morty and would a cool shirt then click on the picture to have a much better look at it and to see if it would be a shirt you would like. 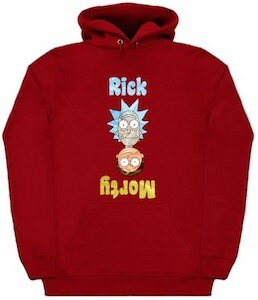 Now there is this fun Rick And Morty Hoodie and it can be yours. The hoodie is available in a normal sweatshirt style or a zip up style and both can come with the design on the front or the back. You can see the pictures of the heads of both Rick and of Morty and Morty is upside down and their names are there too. Now you just have to pick a size between Small and 2XL and a color between black, red, navy, and white and it will look amazing on both men and women. So if you like the crazy Rick and his grandson Morty then now you can wear it on your clothes. 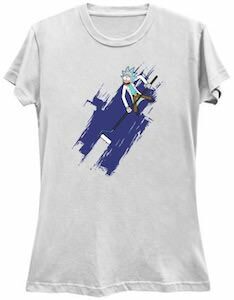 Now you can have this fun Drooling Rick T-Shirt that is just perfect for all the fans of Rick and Morty. This Rick and Morty t-shirt is available in styles for both men and women and comes in sizes Small – 6XL and some colors too. On the t-shirt you can see a portrait of Rick Sanchez and it looks like a sketch and Rick seems to be drooling. 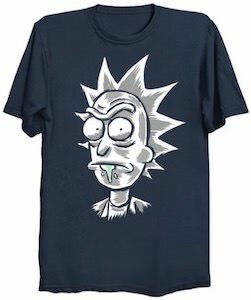 It is just a fun shirt that shows a typical image of Rick and he seems to be drooling something green and that does make you wonder what he is up to this time. Now you can have a The Story Of Rick And Morty Pillow. 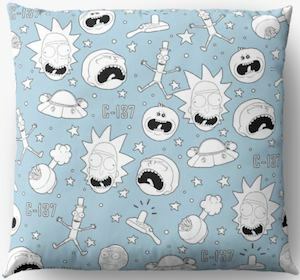 The pillow is light blue in color and shows in white many images of the Rick and Morty cartoon on it and yes that does include the heads of Rick and Morty but also the space ship, Mr. Meeseeks and even a the tag C-137 and lots more. You can get this pillow in a bunch of sizes from small enough for the bed to big enough for on the floor. A pillow like this is a great item to have for a true Rick and Morty fans. Now you can get a drink from your Rick Let’s get Riggity Wrecked Flask. A Rick and Morty flask is what all the fans that like to drink need especially as Rick is know for his drinking. 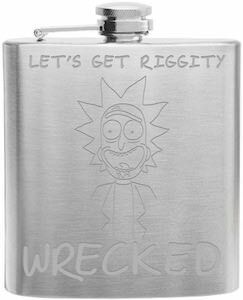 The metal flask has a picture of Rick Sanchez and around him you find the text “Rick Let’s get Riggity Wrecked” and the whole design looks great on the Rick flask. So now you can bring booze to where ever you go but you can put other liquid in it too including just plain water because you have to stay hydrated and carrying this flask is great for that. Now you can get ready for the snow with your new Rick And Morty Winter Hat. The beanie hat is knit and has a black color with on it some color full rows of shapes and in between the faces of Rick and Morty and then on the rim it even says “Rick And Morty” just in case people do not know who those two character are. 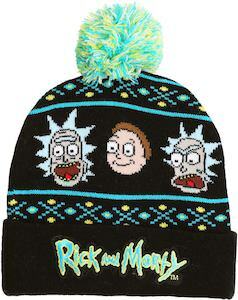 And this Rick And Morty beanie has a fun pom pom on top and is one size fits most adults. Now you can wear your hat and get ready to play in the snow. Rick and Morty fans can now have their own adventures all thanks to this Rick And Away We Go T-Shirt. This is a white t-shirt that comes in a bunch of men’s sizes but I am sure it will look fun on women too. 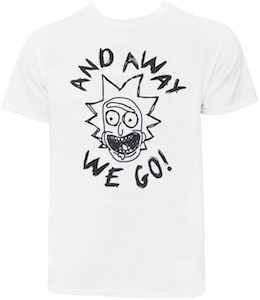 On the shirt you can find a drawing of the head of Rick Sanchez with his famous excited facial expression and then around the head of rick it says “And Away We Go”. So if you like crazy adventures like Rick then go do something crazy and exciting while wearing this Rick and Morty t-shirt as it will be just the perfect outfit for an adventure. Rick and Morty fans can now have their own Rick bobblehead that is made to dress up your car. This is a dashboard dancer that easily sticks to the dashboard of your car and it looks like Rick from Rick and Morty and he will shake around while you drive around all thanks to the build in spring. Besides in your car you can use this Rick figurine at home or the office too as it is kind of a fun bobblehead. The figure of Rick Sanchez is 5 inches tall and is made from resin and is just great fun to have for a road trip.